This is one of my favorites for just us and for company. I got this recipe from my sister. Lots of my good recipes come from her. She's kind of amazing. 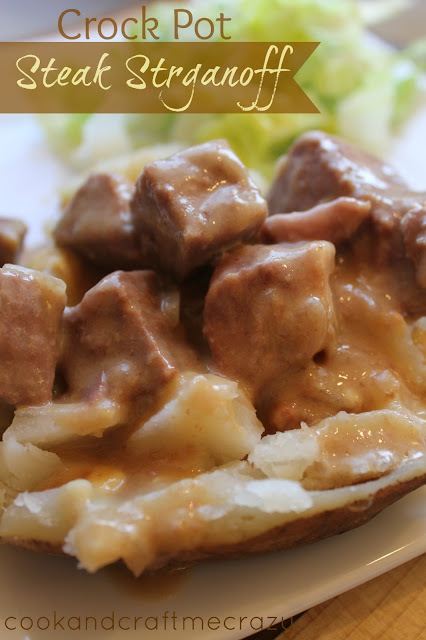 My sister introduced us to having this stroganoff on baked potatoes about a year ago and I can't go back. DELISH! You can put it over baked potatoes, rice or noodles, all are fabulous. I love that I put the stroganoff in the crock in the morning and don't touch it until dinner time. This is so easy, and SOOO good. I recently had my in-laws over and they loved it! Score. This is a MUCH better alternative to hamburger and gravy. I can't even imagine going back. It almost sounds yucky compared to this. Just try it. You won't be disappointed. Place the meat in a greased crock pot and sprinkle the onion soup mix (or the bouillon and onion) over top. In a bowl mix together the soups and water. Pour over the meat and onion soup mix. Cook on Low for 8-10 hours or High for 4-6. DELISH! *I wanted to make this one Sunday and didn't have mushroom soup or celery soup and I tried Cream of Chicken soup and it was JUST AS GOOD! Just the same creaminess, just not as salty. So don't be afraid to use Cream of Chicken if you ran out of the other 2. *When done, it's amazing to put a dollop of sour cream on top. It cools it down and adds even more creaminess to the meal. I especially love the sour cream with the baked potatoes. I'm co-hosting the Sweet & Savoury Sunday link party right now and would LOVE to have you stop by ChattingOverChocolate.blogspot.com and share your delicious recipe! You're welcome to bring a couple other favorites as well if you'd like! Hope to see you there :) Have a great day!! oh yeah, this is my kind of dinner! Will be making this soon :) Thanks for sharing it with us.